Making your boutonniere is an easy DIY wedding task that can save you money without a lot of time or difficulty. Although there are several steps, each of them is very quick and easy. A beginner can make this boutonniere in less than 5 minutes. You'll need to buy some floral supplies, but especially if you are making bouquets that will also require those supplies, you can easily cut your floral bill in half. If you have a refrigerator with no fresh produce in it (the produce gives off an enzyme that wilts flowers), you can assemble the boutonniere up to two days before the wedding. Otherwise, make it the day before the wedding, and store it in a cool place. Before you get started, you'll want to pull together what you'll need. You'll also need the following florist supplies, which can be found at most major craft stores or floral supply stores. Begin by removing a single bloom from the stalk of orchid. Hold the bloom in one hand, and then poke the soft-gauge florist's wire straight through the base of the stem, as pictured. One of the advantages of this DIY boutonniere is that it is easy and economical to make enough for everyone in your bridal party. Since one stalk of orchids can have as many as 20 blooms on it, you'll be able to make plenty of boutonnieres. 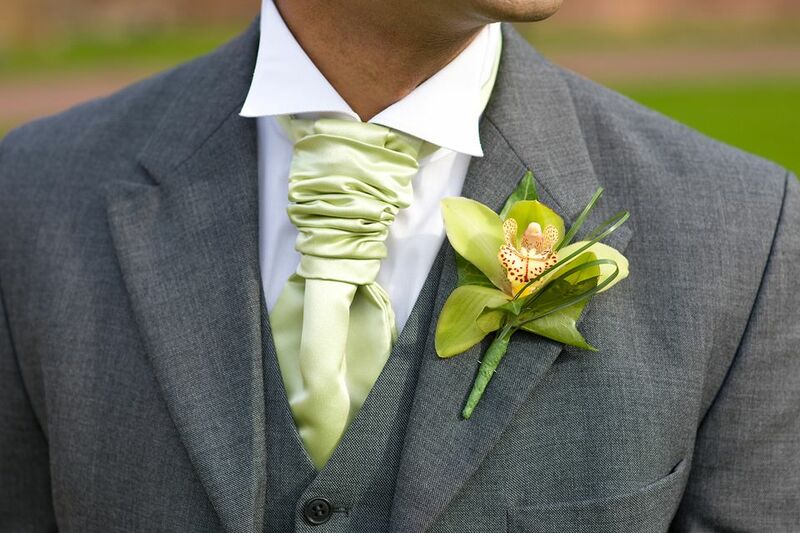 But many couples like to distinguish the groom by making his accessories slightly different from the others. A crystal accent pin is an easy way to add a little sparkle to his boutonniere. Just insert the pin directly into the center of the bloom. Holding the wired orchid in one hand, use the other hand to wrap the tape tightly around the top of the stem twice to secure it. Waxed florists tape is not very sticky, so you need to stretch it tightly to have it adhere correctly. If you have used a crystal accent pin, you'll want to make sure that you completely cover the sharp end of the pin with tape, so that you won't stab yourself while you are working. Form a loop with the lily grass, then place it behind the wired orchid. Use your judgment to make the loop proportionate to the size of your orchid. Here, our bloom is about 2" across, and the loop is about 2" in height and ¾" in width. This will add greenery to your DIY boutonniere, and give it depth and shape. Secure the lily grass with two tight winds of the floral tape. Then, neatly wrap the tape about 1.5" down, forming an attractive stem for your boutonniere. First, use wire snips to cut the wire exactly at the length of the tape, so that no wire is exposed. Then, use scissors to cut the grass at an angle. Cut the grass 1/2 of an inch below the end of the tape, so that you have two little tails that mimic the end of a ribbon. Tada! You've made your first elegant and easy boutonniere! You probably now have the supplies to make a dozen more, if you'd like. To store the finished boutonniere, place it in a plastic zip-top bag and seal it ¾ of the way. Blow air into the bag, so it is fully inflated, and the flower is protected, then seal completely. If you have a refrigerator without ANY fresh fruits or vegetables in it, then store it in the fridge for up to 2 days. Otherwise, put the plastic bag in a cool spot for up to a full day. Just before the wedding, pin the boutonniere on the groom. (It's best to have someone other than yourself to pin it on you.) Place the boutonniere on the center of your lapel. From the back of the lapel, insert a pearl-headed boutonniere pin, cross over the stem, and reinsert into the fabric. With this easy orchid boutonniere, you're a sharply dressed and elegant man, ready to head down the aisle and get married.